If we have contact lenses available, why don't we have versions that offer sun protection, like sunglasses vs. glasses? It seems like it would make a lot of logical sense, though I guess the illusion on your actual iris. If someone knows of this invention, please share it with the rest of your fellow readers. 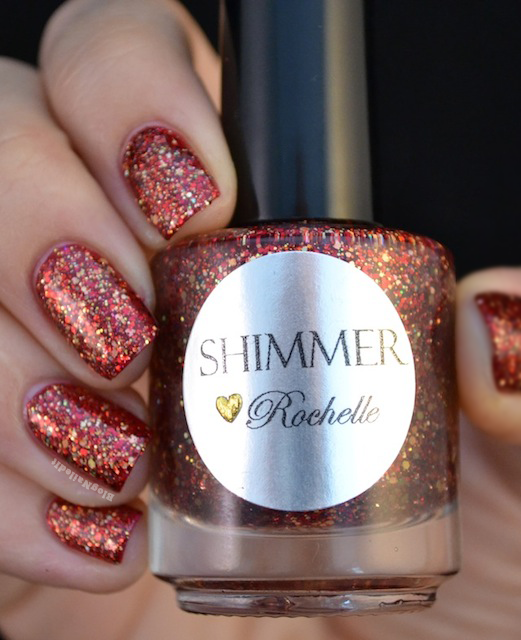 It's almost imperative you grab a pair before reading this post, full of swatches and reviews of seven gleaming polishes from Shimmer Polish. I decided to use some undercoats for all of these polishes because I liked the way they looked with some contrasting and matching cremes underneath, but each and every one of these babies is potty-trained and free to take off the protective underwear at 3 coats. Try different base coats beneath your own versions though for some really interesting effects! Here I tried one of the polishes, Jasmine, with a Color Club color, Pucci-licious. For the sake of your brower's sanity, I'll bury these guys under a cut. 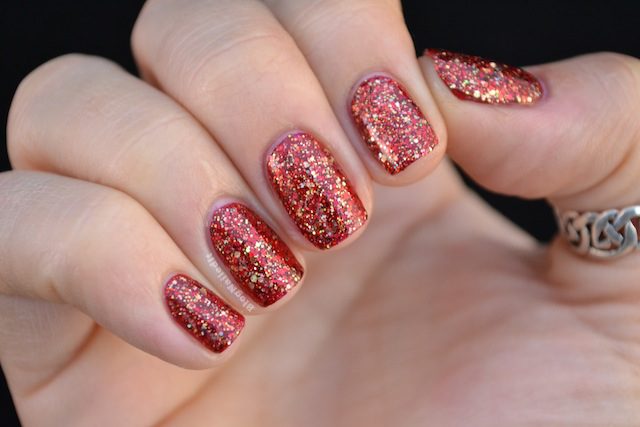 The first combination uses Kalahari Kiss (China Glaze) and Adrienne. I've decided to take some little closeups for you, so I don't need to go into detail about each color of glitter. Sometimes it's best to let your fingernails do the talking. This is Light Mist (Savina) with Liana. 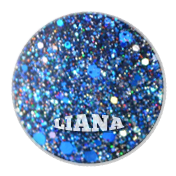 There's less gold glitter in Liana than in Adrienne, and a bit more blue and purple. I think the sizes are also generally smaller in this, but without the recipe, I'm really just shooting in the dark. Mermaid's Tears (OPI) is topped with Jasmine for the next swatch. The color for this one was tough to capture in my mini shot. It's a richer teal in real life, and I think the swatches below show it better. I love gold glitter polishes. 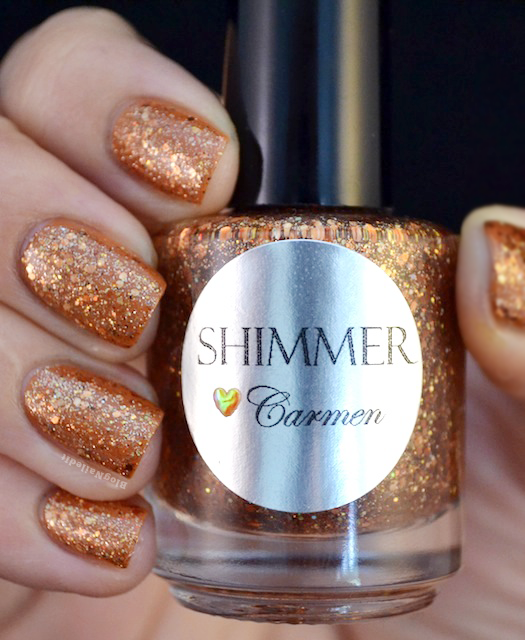 Adding to the collection is Carmen, shown here over Desert Sun (China Glaze). I love this next polish. 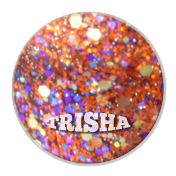 You can see in the closeup that there's purple in the glitter, and the orange goes perfectly with it. 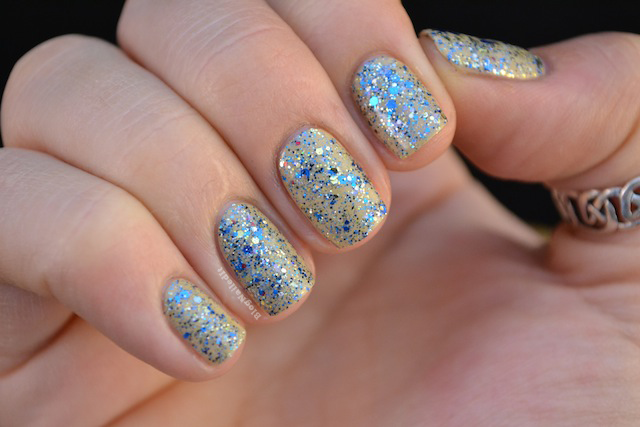 Check out Trisha over Arizona (Zoya). Are you blind yet? You wouldn't be if there were contact sunglenses. (I'm coining that term right here and now.) 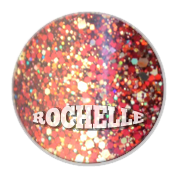 Rochelle is perhaps the brightest swatch in this post, and I believe that's due in part to what I put underneath, Adventure Red-y (China Glaze). 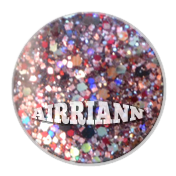 Finally there's Airriann. It wins for most unusual name, which I'm still unsure how to pronounce. It's shown over Steady as She Rose (OPI). 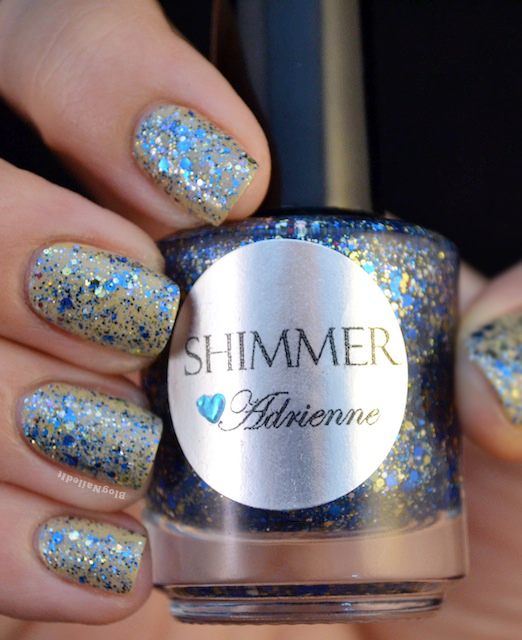 So those are a few of the glitters from Shimmer Polish. If you're interested in any of them, or your very own personalized custom order, complete with select naming and shimmer, give Cindy a shout at her store. 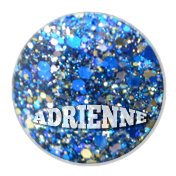 Cindy says, "You can personalize the name and the colors of the Shimmer! This will depend on my availability. Please contact me if you have questions." I whole-heartedly love these. While they're not the typical bright matte glitters I gravitate towards, I'm excited about them. Their consistency is not too thick to work with. It's rather perfect in fact. One reason is that although she uses about 1300 different glitters in each polish, none are obnoxiously large, and the smaller bits balance out the bigger ones, allowing for easier application. They almost cushion the larger pieces from the harsh surface of your nail, and let the bigger sizes float on top without sticking out and getting caught on your loose strands. 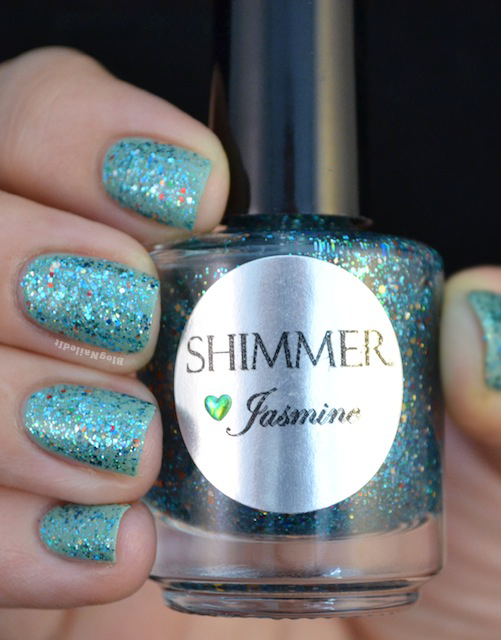 Again, you can pick up these and other colors from the Etsy shop, Shimmer Polish or the online store, Shimmy Shimmer. These products were sent to me by Shimmer Polish. The reviews are based entirely on my experience with the products and were in no way influenced by anyone. 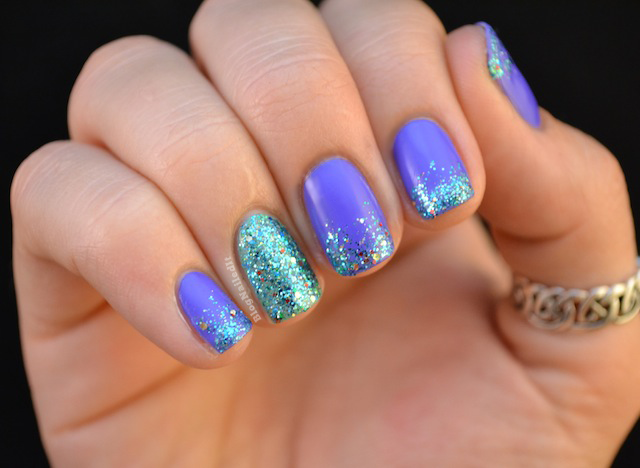 What amazing glitters! I especially like the gradient you did in the beginning :) I think it Airy-in kinda like the pure German race haha. Not to sound racist, but that is how I would pronounce it! omg if they made sunglass contacts, that would be sooooo awesome! 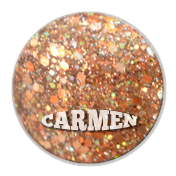 Carmen and Rochelle are fantastic! Might have to get those basecolours aswell! Each and everyone one of these polishes are amazing! Love the first photo with the purple nails, really pretty. Trisha looks so cool! A great combo of colors. Great swatches too! 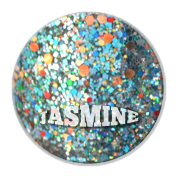 Oh I NEED Jasmine...cuz that's my name <3 and its gorgeous! Can you imagine if they made contacts like glasses with transition lenses & when you see someone walk outside their irises (ires? LoL) turn black all of a sudden? That would be FREA-ky! hahah. But love the first mani. Might try to replicate it tonight. I love the mix of jasmine and Pucci-licious.